Steve's note: Over 20 years reporting at The Oklahoman I've been blessed to meet people who were truly living history. Whether you like him or not, it's difficult to deny the feeling of world history stemming from a simple handshake with Jesse Jackson. I've been in the same room as presidents, governors, heros and crooks. And then there's Pody Poe, who stands alone. 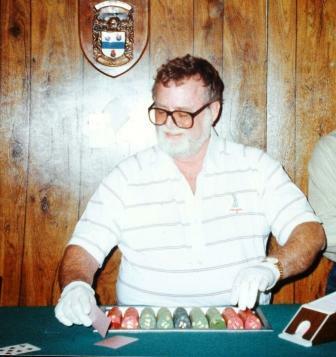 For years growing up in Oklahoma City I heard vague references to the "casino" in Nichols Hills. When I got my drivers licence, being quite naive, I drove around Nichols Hills looking for said casino and finding nothing. It was only when I was a cop beat reporter at The Oklahoman that I began to hear the legend of Pody Poe. And when Poe was released from prison a much older, beaten down man, I wasted no time in trying to talk to him about a biogrphy he had written. It was easy to see why Poe, in his heyday, was so likeable. He seemed to have no ego and was eager to please. He invited me into his apartment at The Links along NE 122 and was quick to show he was no longer into gambling and didn't even have any liquor in his posession. Many of the people he once entertained in his "casino" (it was actually a converted garage at his home) probably would be OK with being outed as having been his guests. But after promising to name names in his biography, Poe had once again pulled off a classic bluff. Sure, he showed photos of the celebrities (mostly those who had already passed away) who had frequented his games (Mickey Mantle was a good friend of Poe's). But the wealthy scions of Oklahoma City could rest easily knowing Poe wasn't about to create any discomfort for them. I pressed him, of course. 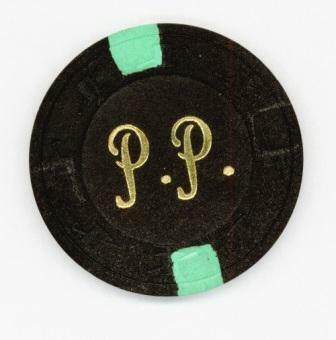 The best I could get was a personalized gambling chip - one I still proudly own. Poe was ultimately a performer, and when it came time to getting his portrait done for the paper, he arrived wearing a stunningly colorful outfit that on anyone else would have looked clownish - but on Pody, the outfit was simply regal. The bulb flash was clearly painful for Pody, who winced in pain as the light glared into his cataract-wrecked eyes. But he held firm and provided us with perhaps the best photo ever of Oklahoma City tin horn gambler. Pody Poe promised he was through with gambling. 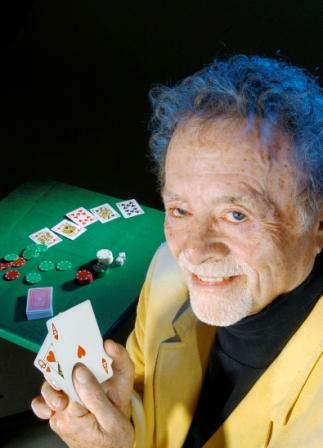 No more blackjack games, no more high-stakes poker in the garage of his Nichols Hills home. But authorities were leery. After all, he was, in their estimation, the kingpin of gambling in Oklahoma - bluffing was part of his nature. So the game was on. In 1987, after Poe spent four months in federal prison for illegal bookmaking, the court was promised he would turn to selling used trucks. Law enforcement bided its time. During more profitable times, Poe's 485-square-foot garage was an oasis of decadence where a man could win more than $100,000 in less than an hour, Dixieland jazz bands entertained crowds of trust-fund babies and cocktail waitresses served up free whiskey and cigarettes. But Poe swore he was a reformed man in the 1990s. After nearly a decade of waiting, authorities were ready to make their move. A raid of his home in 1995 revealed Poe had indeed been bluffing. He was once again incarcerated, this time at the Fort Worth Federal Medical Center. Poe has never denied he likes a good game - nor that he once oversaw an operation where thousands of dollars were won and lost every day. For Poe, gambling is more than just a game; it's an exciting shot at entrepreneurship where one's reputation and integrity mean everything. But at 72, and four years from what he says is his last stay behind bars, Poe says he's done with games. Behind the same wry smile Poe used to raise numerous pots, Poe says now he doesn't even own a deck of cards. The walls of the modest apartment he currently lives in are adorned with images from his past. The faces are familiar to gambling enthusiasts. To Poe, they're just old friends. Friends such as the late Benny Binion, who was forced from Dallas to Las Vegas, where he opened Binion's Horseshoe - birthplace of the World Series of Poker. 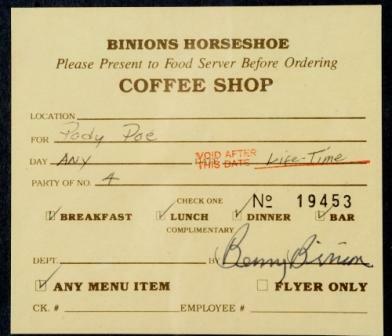 Binion gave Poe a lifetime pass to dine at the Horseshoe restaurant with three guests and no limitations on the wine list or menu. He also claims past associations with current Las Vegas tycoons, including Steve Wynn and Bobby Baldwin. After time in prison, a bout with cancer and a diagnosis of diabetes, Poe is slimmer and sober. But he won't give up the cigars. "That;s my only vice. I'm retired from the gambling business, I'm a recovering alcoholic, and girls are at best a hobby." Poe has plenty of regrets - not being a good dad to his kids, his four failed marriages - but he's proud of his 35 years in the gambling business. "They say a man ought to have at least three careers in his lifetime," Poe said. "I'm onto career No. 4 - author and speaker." Poe begins that career with the release of his book, "From Tinhorn Gambler to Kingpin of Organized Crime." In it is a tale that was never told in the dozens of newspaper stories printed about Poe from the time he was 2 years old. A successful gambler at some level is a good storyteller. He's a people person. Poe's book starts with the story of an Oklahoma boy whose family briefly moved to California during the Great Depression - "when times were good." Poe's father was a songwriter and entertainment promoter. And in a childhood spent partially in Hollywood, Poe grew up in the presence of such legends as John Barrymore, Bob Hope and Bing Crosby. A scan through newspaper archives picks up on Poe's journey as a student while living with his Oklahoma relatives. One story records his unsuccessful run for student council. Other clippings mark his feats as a winning debater and golfer. Poe tried to join his father in his career, but quit after they were scammed on an event they promoted in Kansas City. While golfing and hanging out at the pool hall, Poe began to pick up a taste for gambling. He didn't turn to gambling as a profession at first. He tried selling insurance and said he did well at it, but quit because he didn't trust the insurance executives who signed his check. He did trust Leroy Dale Hines - nicknamed "The Bear." Federal authorities alleged "The Bear" wasn't just a Tulsa bookmaker. After more than a decadelong friendship, Hines and Poe found themselves snared in the FBI's first prosecution of the Organized Crime Control Act. The feds claimed The Bear was the godfather of organized crime in Oklahoma, and that he was tied to the New Orleans crime family headed by Carlos Marcello. Don't believe it, Poe says. To this day, Poe has nothing but admiration for Hines, now deceased. Poe said he learned from Hines what makes for a good gambler - and also a successful businessman. "How many people do you know in your life that if they told you something, you would know that it's true?" Poe asks. "Or if they say they're going to do something, you know it's going to get done? That's what built this country, a nod of the head, a shake of the hands being binding on all parties. But that's gone now, and we're living in the land of the loopholes." Gambling may be the last vestige of free enterprise left in America, where a man can open up based on the strength of his reputation and ability and succeed. Poe prides himself for having escaped more federal indictments than John Gotti. He can show evidence he was friends with Los Angeles mobster Mickey Cohen. But Poe can't understand why the FBI bestowed on him the title of "kingpin." The arrests started in the 1960s, as Poe built up his own bookmaking operation. First it was just local police slapping on the handcuffs. In those early busts, Poe hid his head under his coat as photographers snapped his picture. By the time he was fighting the U.S. Justice Department, Poe was posing for the cameras, coyly ducking questions about whether he was engaged in gambling. After he beat federal authorities on three indictments, he decided to turn an occasional game in his garage into a full-time occupation. Business was slow at first. He would stay open all night just to see a couple of gamblers make their way to his table. A stint in Las Vegas had taught Poe a lot about how to make customers comfortable. Guests were treated to everything but the poker chips. Before long, word spread of the garage game. Guests thronged, and many had had to leave their cars in the parking lot of a nearby church. Poe was paying a cigarette and whiskey bill of about $500 a week. A handful of guests could watch the game from an L-shaped couch; seven people could sit at the table and play. No more than 20 people could be in the garage at once. Poe got used to hearing women complain about the air conditioning. "You try to keep it cold, at about 68 degrees, because you don't want to be gambling as a player when you're overheated," Poe said. "You're already going to be generating a lot of body heat." A mirrored window allowed Poe to keep watch over the game from an adjoining closet-size office. The game ran from 9 p.m. through 2 a.m., fall through spring, and 10 p.m. to 3 a.m. during the summer. Poe learned early on that a strict closing prevented gamblers from trying to endlessly extend their luck - or misfortune. Sometimes, a drunk would be locked inside the garage when the game was over. Usually, Poe said, the only trouble was lawmen trying to make their name busting the game. "They come with enough people to storm a pillbox," Poe said. "And they see too many movies having these guns. They'd ask me, 'Where is your gun?' I'd say, 'Why would I have one?' They'd say, 'Aren't you afraid of getting heisted?' And I'd answer, 'It looks like that's what is happening to me now.'" "I was born a little out of my time. Who would convict anyone of playing 21 now?" During his heyday, Poe didn't shy away from reporters. And when he wasn't making headlines with his battles with the FBI, his wife, whom he called "Barbara No. 2," was out promoting an antifeminist movement that urged women to be supportive of their husbands. If Poe's name wasn't listed in the indictments, he was making the sports page rundown of charity golf tournaments. His businesses began to multiply, with holdings including the Hook'n'Slice miniature golf course, go-carts and activity center along Wilshire Boulevard. That's all gone now. The Nichols Hills home was seized by authorities when they made the latest criminal charges stick. Poe thinks he has a good shot at success as an author and lecturer. If someone wants to be a successful gambler, Poe thinks he's got the answers. He still argues that federal authorities wasted millions of dollars prosecuting him. How could they not have, Poe asks, estimating how much the government spent on wiretaps, experts, surveillance and attorneys. He laughs to think that anyone can now play the same games on their home computer. But he objects to casino gambling in Oklahoma, arguing that Las Vegas was a railroad watering stop and Atlantic City a slum prior to becoming casino towns. "If you (already) have an economy, casino gambling will destroy it," Poe said. "All of this is just a painless way to tax the poor." Likewise, Poe is no fan of the lottery voters approved in November. "The worst uphill struggle you can take in a casino is probably Keno," Poe said. "And it still pays two and a half times more of your money back than our lottery. The lottery is the biggest sucker bet to come along." Poe portrays himself as the friendly neighborhood bookmaker. He scoffs at old allegations that some of his unlucky customers were physically threatened by collectors or that he took money from anyone who couldn't afford to play the game. "I never wanted to win a man's paycheck. I wanted the people who wrote the paychecks," he said. Poe lights up a cigar as he watches old home movies. His family, including his kids, grew up around the game. So maybe it wasn't the best environment for raising kids, Poe says. Traci Poe got caught up in the last raid and shared her dad's punishment. But she's doing well now, running a hotel catering operation. He thinks his other four kids also are doing well. Poe admits there is a harsher version of his story still floating around. These tales, he argues, were spun by federal agents looking to make a name for themselves. Poe promises that in his book, he's naming names. "I have my view, and it may differ from the readers' view," Poe said. "They can make their own determination as to whether I was persecuted or prosecuted." Nov. 29, 1932: Tracy Coy "Pody" Poe is born. 1934: Poe makes his first front page headline when he falls out of his family's car while the vehicle was going 65 mph. 1935-1937: Poe's father, Coy Poe, leaves Oklahoma City for Los Angeles, where he composes music and helps produce five movies. Pody Poe goes to school with John Drew Barrymore Jr. - the father of actress Drew Barrymore. 1940s: Pody Poe's parents divorce, and he travels between his father in California and relatives in Oklahoma. As a teen, Poe begins to hang out at the Central Club, an Oklahoma City pool hall, where he watched pros, including Minnesota Fats. Poe begins his lifelong love of golf at Edgemere Golf Club. It's there he meets some gamblers. They flip a coin to see who pays for lunch. 1953: Poe enrolls at the University of Oklahoma, marries "Barbara No. 1," and begins taking bets on games. Authorities confront Poe, and he loses his college grants. Poe divorces "Barbara No. 1." He later finds work selling life insurance. 1957: Poe marries again, this time to a secretary. The marriage would last five years. 1964: Poe quits insurance, believing the gambling business was more ethical. June 14, 1967: Poe's first gambling arrest. Sept. 15, 1967: Poe arrested again, while in possession of bookmaking equipment. Sept. 22, 1967: Poe arrested a third time, with football schedules. Oct. 10, 1967: Poe arrested a fourth time. Nov. 2, 1967: Poe arrested by El Reno police for operating a public game. Nov. 25, 1967: Poe arrested a fifth time by Oklahoma City police. 1968: The arrests continue. Poe marries "Barbara No. 2." 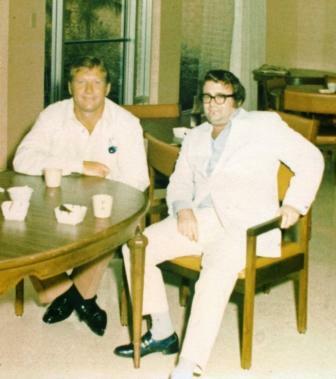 Early 1970s: Poe works at Las Vegas hotels and casinos, and gets acquainted with Steve Wynn and Bobby Baldwin, who would later become corporate casino titans. 1971: Federal authorities call Poe a kingpin of organized crime as they arrest him under the new Organized Crime Control Act. 1972: Poe moves his family to Nichols Hills, where he runs a bookmaking operation. 1975: Poe's arrest for extortion makes front-page headlines as he fights allegations that his collectors threatened the life of a gambler who hadn't paid. Poe is acquitted. 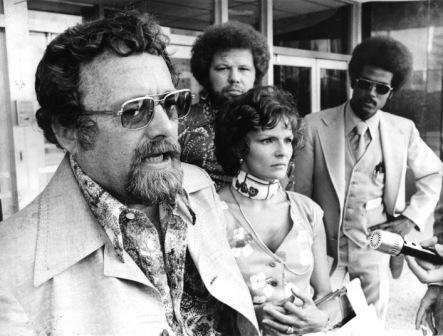 1977: The Internal Revenue Service raids Poe's Nichols Hills home. 1978: Poe sets up blackjack, or 21, and craps games in the garage. 1981: A federal grand jury indicts Poe for illegal bookmaking. 1984: Authorities raid Poe's home. Poe pleads guilty to gambling charges and is sentenced to 18 months. 1985: Poe is released early from prison after attorneys tell U.S. District Judge Lee West that the gambler was "rehabilitated." Poe promises to move to Texas, where he plans to sell used trucks. U.S. Attorney Bill Price says he's very skeptical. Poe resumes games in his garage. 1997: Poe is sentenced to five years in federal prison after a jury convicts him for running an illegal gambling business and laundering more than $300,000. 2000: Poe is released from prison. 2003: Poe's sentence is commuted to time served. 2006: Poe dies at age 73.